Alt-week takes a look at the best science and alternative tech stories. It’s 2013 and yet somehow we haven’t ascended into a creature made of pure energy, so we’d better put some clothes on and get back to work. We’ve got lasers that are made from gas, a team of student physicists that are determined to prove George Lucas wrong, the world’s oldest underground railway celebrating its sesquicentennial and we’ll learn how the NYPD wants to track drug addicts with GPS. If that doesn’t sound like the Alt-weekiest Alt-week you ever did see, then we can’t be friends. A team of physicists from the Institut Non Linéaire de Nice have discovered how to produce a laser from a cloud of gas for the first time. Normally, Lasers amplify light by bouncing it around inside a confined space like a crystal, simulating the emission of radiation. While the phenomenon has been found on other planets, reproducing the effect on Earth has been difficult, because gas is less ordered and refined than your average crystal. The team succeeded by using a cloud of rubidium in a magneto-optical trap, and the discovery should help scientists understand more about gas lasers and help them to discover new forms of artificial light. 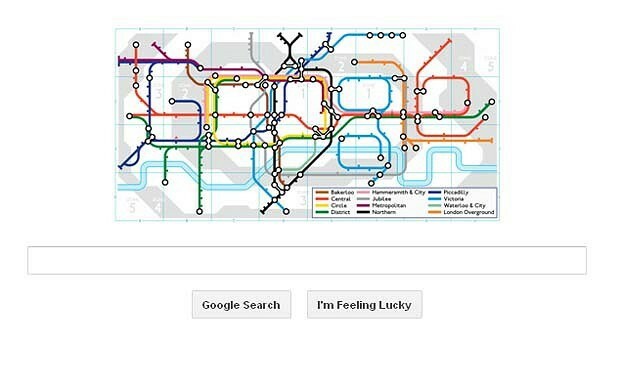 The world’s oldest underground railway had its 150th birthday earlier in the month, and Google celebrated the moment with a Harry Beck-themed doodle. London’s Metropolitan railway opened up on January 9th 1863 and has been serving customers ever since. London Underground will also be recreating the journey by pulling a steam locomotive between Paddington and Farringdon — the hottest ticket in town, give or take the odd show. 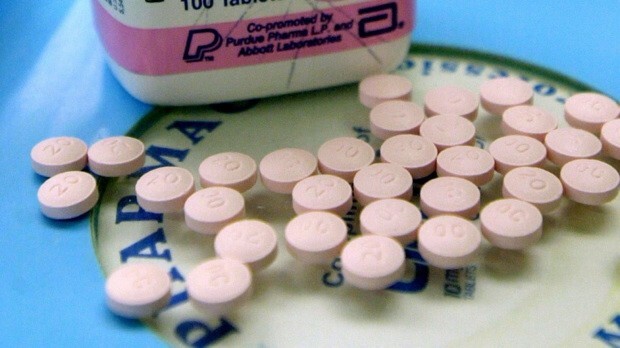 The NYPD is working with pharmacies in New York to add GPS trackers to OxyContin bottles in order to track thieves across the city. Commissioner Ray Kelly is announcing a plan that’ll give pharmacists “bait” bottles to hand over the next time they’re robbed, letting the police know exactly where they end up. Commissioner Kelly is also asking researchers to develop trackers small enough to fit inside an individual pill — which sounds great for law enforcement officials, but might make the ACLU wince a little. 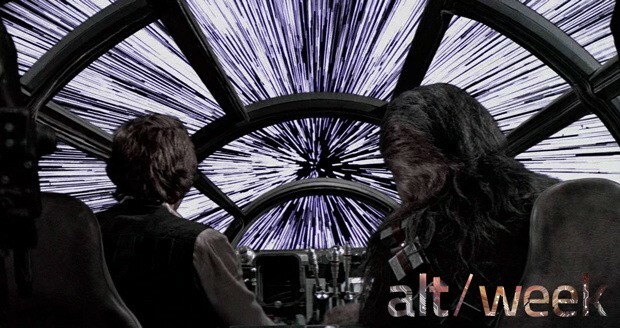 From Star Wars to that Windows screensaver, everyone knows what Hyperspace looks like. As your vessel makes the jump, the stars instantly become streaks of light that zoom past your eyes. Except a quartet of students from Leicester think that the reality would be closer to staring into a light bulb. 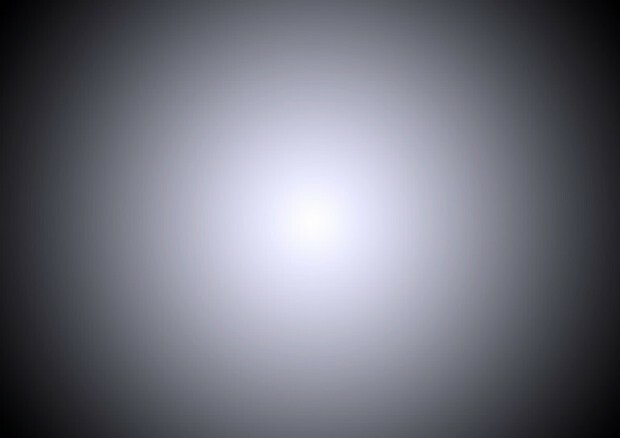 Thanks to Doppler blue-shift, visible light would shorten and shift into the X-ray spectrum, while cosmic background radiation would go the other way. The result would be a central disc of bright light that emits so much pressure that it’d feel like you were trapped at the bottom of the ocean. Riley Connors, one of the students determined to disprove George Lucas said that “sunglasses would certainly be advisable,” as well as some lead-lined clothes to keep out all of those X-rays. Seen any other far-out articles that you’d like considered for Alt-week? Working on a project or research that’s too cool to keep to yourself? Drop us a line at alt [at] engadget [dot] com. While it’s being wheeled through the FCC’s underground Washington bunker, it’s merely known as patient PY7PM-0280. 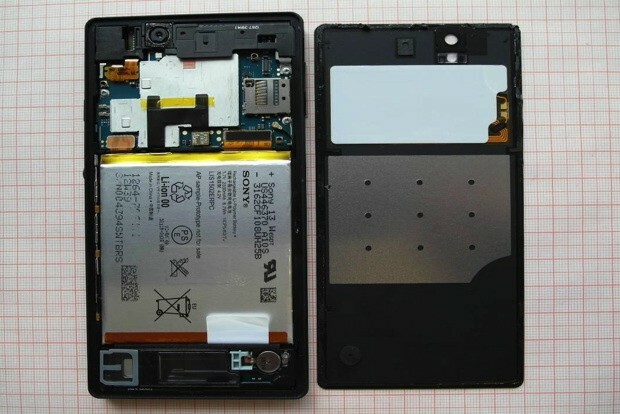 It’s only once it’s been through the ordeal of being torn to pieces and put back together again that we can call it the Sony Xperia Z. Given that the documents are now available, it’s clear that the commission feels the collection of GSM, LTE and 802.11 a/b/g/n modems are safe enough to hold one to the side of your head. Even better, the snap-happy techno-vivisectionists also included a gallery of teardown pictures, letting us peek inside the guts of the smartphone — which is good, because if we tried it ourselves, we’d probably void its waterproof properties. 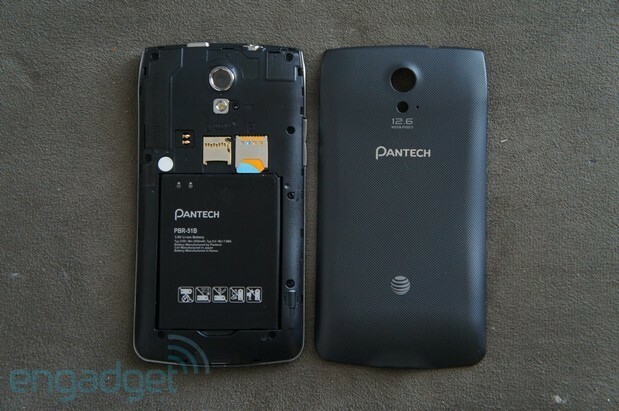 Watch out, folks: Pantech is moving up the AT&T food chain. Once known in the US as little more than a budget brand, the Korean company is learning that it’s possible to push out a device with premium components without increasing the going price (while choosing an outside-the-box design at the same time). The latest piece of evidence supporting this is the Discover, a $50 smartphone with enough trimmings to turn some heads. But will the phone set a new precedent for its pricing tier, or is it just blindly checking off items on a spec sheet to-do list? Follow us after the break and find out. On our stage at CES, Pantech’s Manager of US Marketing Chandra Thompson told us that nearly 60 percent of the company’s employees are dedicated to R&D, a claim that certainly can’t be made by very many companies. We were quite surprised to hear that from a company like Pantech — it caters almost exclusively to the penny-pinching demographic in the US, so it’s easy to dismiss its hardware as cheap and unexciting. 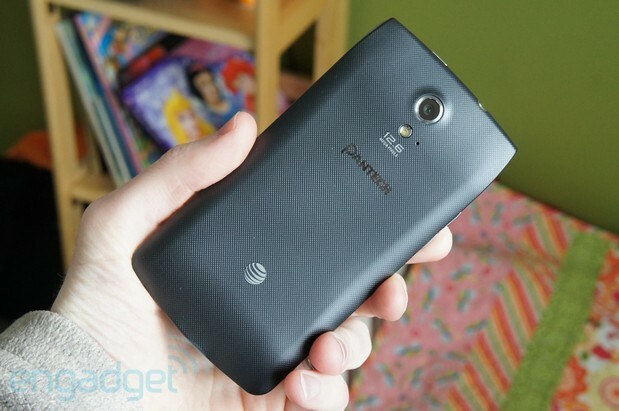 Au contraire, naysayers: the Discover, Pantech’s latest budget-friendly offering on AT&T, actually bucks the trend of the stereotypical slab, making it a visually arresting device to behold. The curvaceous back is chock-full of contours, but each one is done up in a way that enhances how the phone feels when you hold it in your hands. (We can’t help but be reminded of the Sony Xperia arc when looking at it.) In fact, we’ll go ahead and say that the Discover is one of the most comfortable phones we’ve used in recent history; its chassis hits the ruler at 134.2 x 68.6 x 9.1mm (5.3 x 2.7 x 0.36 inches) and gives us a solid grip that made us confident it wouldn’t slip out of our grasp. It’s also relatively light, weighing in at 4.76 ounces (135g). Much of that has to do with the textured plastic material on the removable back panel, which adds just the right amount of traction without drawing too much attention to itself. The Discover is not only attractive; it also exudes durability. If you’ve only handled it for a few minutes it might be hard to tell that the device is as inexpensive as it is. We were happy to discover (pun not intended) that the back doesn’t flex or creak when you add pressure, lending even more credibility to the phone relative to its pricing tier. The front of the device shows off the 4.8-inch 720p TFT screen, with a 2MP front-facing camera and the typical array of sensors above. You won’t find any capacitive nav buttons on the bottom, as the Discover uses virtual keys instead. To take the place of the missing keys, you’ll expectedly find a Pantech logo. The sides are where the Discover starts to get really interesting. 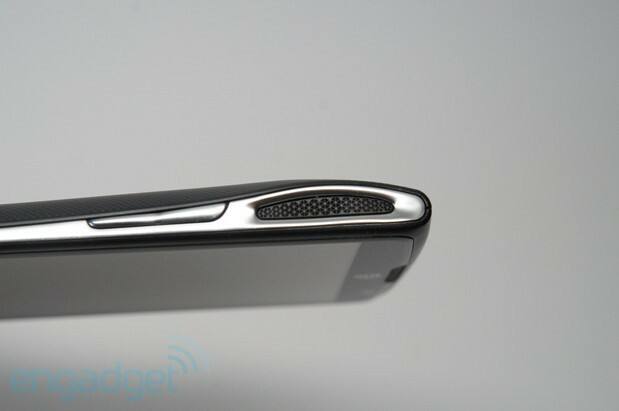 The phone bulges near the top to make room for a pair of 3D surround sound speakers, and the back cover tapers inward to meet up with the chrome edge. The speaker grilles are dotted with a snowflake-like pattern — the only hole in this analogy is that they’re all exactly alike. On the left side, adjacent to the grille, you’ll find a volume rocker that blends in perfectly with the rest of the chrome trim; the top end houses the power button and 3.5mm headphone jack, while the bottom end is where you plug in your micro-USB charger. Completing our tour, we take you to the back of the Discover, which is where the 12.6MP rear-end camera module is located, with the LED flash directly beneath. You’ll also see a pair of logos for AT&T and Pantech, but neither is so ridiculously large so as to distract from the overall elegance of the device. Rip open that removable cover and you’ll find slots for the micro-SIM and microSD cards, as well as the replaceable 2,100mAh battery and NFC contacts. Antenna-wise, the Discover is packed with plenty of radios: GSM / EDGE: 850/900/1800/1900; HSPA+ / UMTS 850/1900/2100; and LTE 700/850/1900/AWS. While most observers may be puzzled by the inclusion of four LTE bands when AT&T’s network is only currently utilizing two (700 / AWS), it actually means that your device will continue working properly if the operator decides to begin refarming 850 / 1900 HSPA+ spectrum for the use of LTE. Many of AT&T’s latest phones offer the same new LTE setup, but it’s typically not advertised — in the past we’ve had to dig into each handset’s FCC filings to figure it out. Rounding out the specs, the Discover also offers aGPS, Bluetooth 4.0, 802.11a/b/g/n, 16GB of internal storage and supports DLNA. That microSD slot is capable of holding cards up to 32GB in size. There is, however, one glaring omission: there’s no LED notification light. Now, let’s dive deeper into the display itself. Typically, the only time we see a $50 phone sporting a panel with a 720p (1,280 x 720) resolution is either when it’s on sale or is near the end of its retail shelf life (such is the case with the HTC One X). Thus, the fact that Pantech is pushing out a device with a higher-end screen at such a low price point should be enough to get any budget-conscious consumer excited. But how is it in real life? How does the display hold up against similar offerings? While the HTC One X still holds the crown for best 720p display, the Discover doesn’t disappoint. It’s not quite as bright as the One X, but it certainly bests the Galaxy S III in this area. We also like the decent viewing angles and natural-looking colors — it’s definitely less saturated than the GS III, but then again, most phones are. It doesn’t use a PenTile matrix, so the fonts were crisp and easy to read without any jagged edges getting in our way. 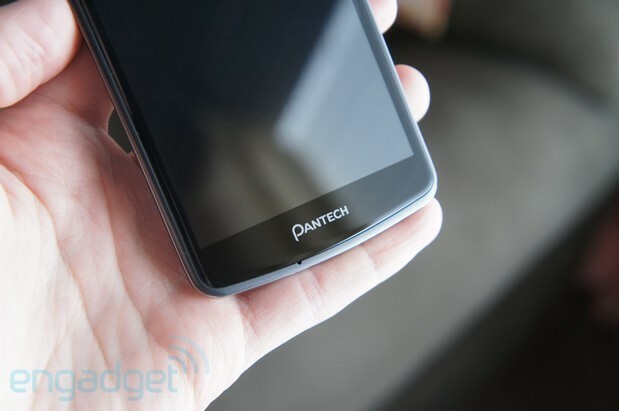 Pantech is just as creative in its firmware design as it is in hardware. The Discover runs Android 4.0.4 (Ice Cream Sandwich), though company reps have told us that Jelly Bean is in the works — unfortunately, they wouldn’t tell us which version, but this is at least a step in the right direction. Despite the fact it’s running now-antiquated firmware, it at least throws in quite a few differentiators that make its custom skin one of the most unique we’ve encountered on this side of the Pacific. For starters, the app dock on the front screen allows 14 total icons, instead of the standard four. How so? If you look carefully, you’ll see arrows on either side of the dock indicating that you can swipe left or right for more shortcuts, folders or apps. We imagine this will only come in handy if you prefer using most of your front screen space for widgets, but it’s a nice touch regardless. 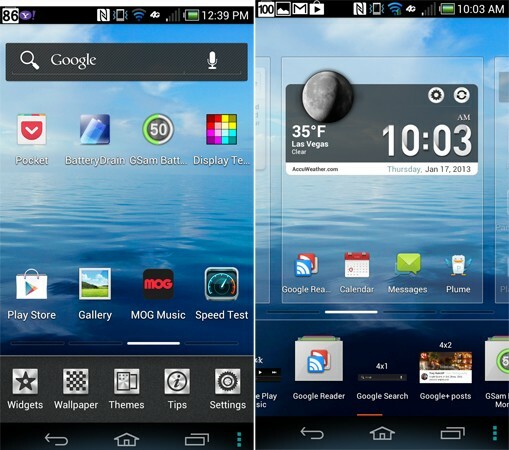 Additionally, while the virtual nav buttons at the bottom of the display feature the usual suite of back, home and recent apps, Pantech throws in a tiny menu button on the right-hand side that’s visible only on the front screen. (It doesn’t replace or duplicate the settings buttons you’ll find in most apps.) Pressing it brings up a menu that overlays the app dock and offers widgets, wallpaper, themes, settings and tips. Sounds great in theory, but it’s absolutely pointless since long-pressing the home screen achieves exactly the same result. Moving on to the app menu, you’ll first notice that widgets are nowhere to be found — you’ll need to access them using the settings bar. Pantech has chosen to use the tab space on top to enhance the group-viewing experience. Essentially, you can choose to put any of your apps into customizable groups — just as if they’re a separate folder — and each group you create gets its own tab up on top. You can also assign each tab its own specific color and change the name to whatever you want; even better, you can also long-press the tab to install the entire group as a folder on your home screen, making it less work for you to set up groups in multiple places. The navigation menu also has a few tweaks of its own: the top of the menu features a quick settings bar (nothing new there) and a second bar for settings shortcuts. This bar, which can be collapsed if you deem it unnecessary, includes icons for sound, WiFi, display, Bluetooth and more — the idea is to get you one step closer to these individual settings, thus reducing the amount of time you spend trying to reach them. We don’t foresee this saving more than a fraction of a second, but it’s there for you as an option if you want. 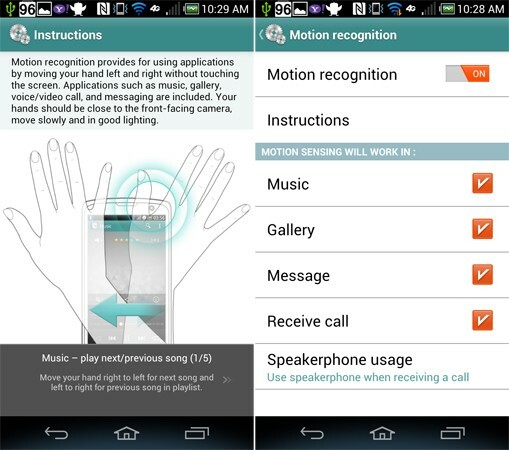 Pantech is also taking a page out of Samsung’s book by introducing its own set of motion / gesture controls. The concept is roughly the same: by waving your hand left and right over the front-facing camera, you can answer calls and navigate through pics and music without touching the screen. It worked much better than we expected; the camera recognized our hands from as far away as two feet. Speaking of looking to Samsung for inspiration, the Discover also features a pop-up video option. When you begin watching a video, tap the proper button near the top of the screen and it hovers above whatever app you want to use simultaneously. You can also do something similar in the music app: the press of a button will float a “now playing” widget (which can be switched to playlist view as well) above your other programs. 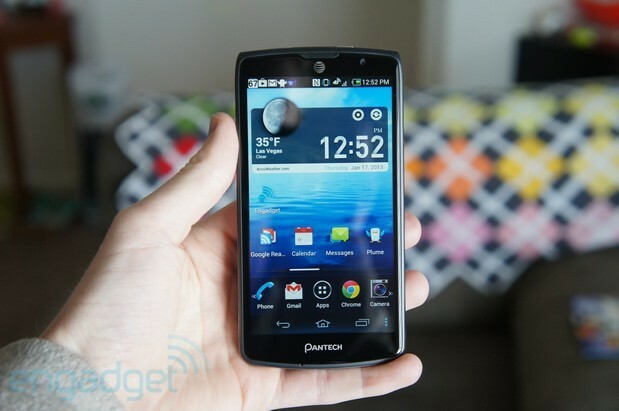 Easy Experience Mode is offered with the Pantech Discover. We went into more detail on this particular feature in our review of the Flex, but in a nutshell: Easy Experience is essentially a special introductory launcher that helps first-time smartphone users settle into the whirlwind world of Android without experiencing as drastic a learning curve. There’s less stuff to customize, the font and icons are a little larger and the app menu is much more streamlined. Not much is different on the Discover, with the exception of a new toggle switch on the main UI, which makes it pretty easy to go back and forth between the two modes. 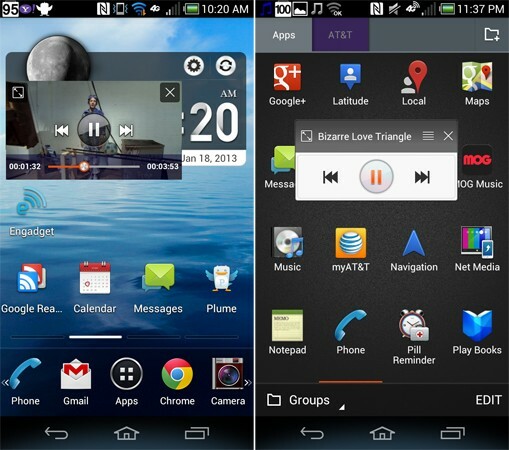 Lastly, the Discover uses the same stock Skyfire browser as the HTC One VX and LG Optimus G (among others). This means it comes with the love-or-hate browser bar at the bottom of the screen that offers several shortcuts and other settings. It appears that this particular browser is here to stay, and we shouldn’t be surprised to see it continue to surface on future AT&T models. One major quirk with the UI is that Pantech doesn’t really take full advantage of the vertical space afforded to it. 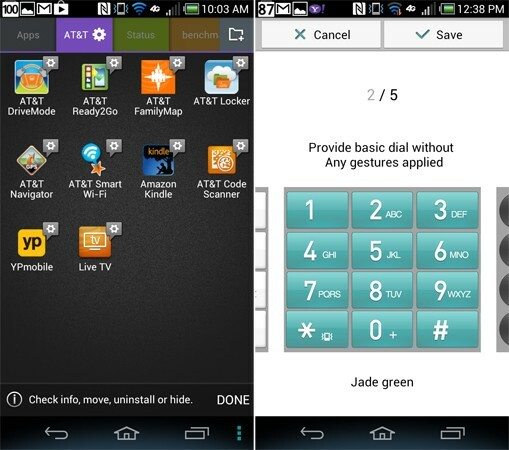 In addition to the virtual keys taking up room at the bottom of the screen, most of the phone’s UI elements are much larger than your typical device. The app dock on the front screen, the extra settings in the navigation menu and even the tabs on top of the app menu are easy to press, but you only get this benefit by sacrificing precious screen real estate. 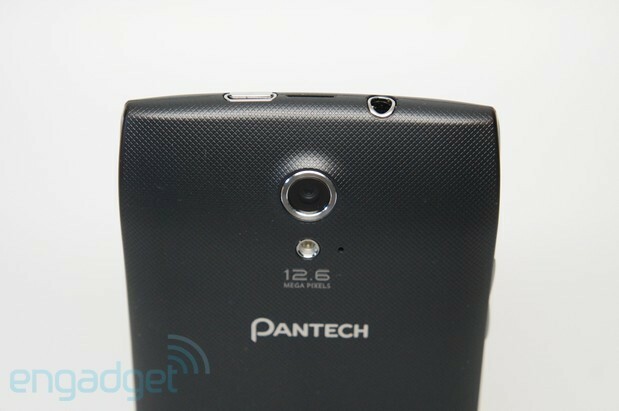 The weakest link in every Pantech phone we’ve ever reviewed is the camera. The 8MP sensor used in the Flex was certainly an improvement over the 5MP models used previously, but it still couldn’t hold a candle to Samsung’s and HTC’s 8-megapixel units. So what did we get out of the Discover’s 12.6-megapixel rear-facing cam? Pixel count isn’t everything, after all. First, let’s go over the user interface on the camera. The shutter button sidebar consists of a few toggle switches: front / rear, camcorder and HDR. The other sidebar is where you’ll find your various settings, as well as shortcuts that can be customized to specific things you tweak the most (this bar is free of shortcuts by default — you have to add them in at your leisure). Among the listed settings are exposure, flash, resolution, white balance, color effects and focus mode (in which you can choose between touch focus and tracking focus). Long-pressing the viewfinder in touch mode will lock your focus, and then you can touch the screen another time to lock exposure. Speaking of which, the Discover is missing the ability to lock focus on objects in low-light or near-dark conditions; the phone doesn’t give us the option to use LED flash as a focus mechanism prior to taking the shot, so you may need to take several images in low light before it truly comes out the way it should. The LED flash itself is sufficiently bright, so that particular part of the camera isn’t an issue. In fact, low-light images in general didn’t turn out very well. Perhaps a big part of the problem is the fact that Pantech didn’t throw in any special modes like the ones you’ll find on the One X, Galaxy S III and other flagships. No low-light, night or candlelight modes are offered; the phone doesn’t even have macro mode. Unfortunately, it’s just not as decked out as we’d like it to be. Frankly, this is to be expected on a phone that is geared toward the budget user, but we have a hard time understanding exactly why Pantech would go through the effort of boosting the megapixel count without enhancing the actual image-taking experience. While we have a difficult time recommending the Discover’s camera over the proven modules found on the HTC One X and Samsung Galaxy S III, the images on the Discover were still at least par with what we originally expected (which unfortunately isn’t saying much). We had quite a few issues with washed-out colors, middling dynamic range and soft focus. The upside is that white balance seemed to be pretty good. Regardless, it’s not the point-and-shoot replacement you’d like it to be. We actually didn’t have so much to complain about with the video capture performance (MPEG-4, 18 Mbps bit rate, 30fps frame rate). It was very smooth when catching motion or panning, and the mics picked up our voice loud and clear. Its only drawback was that it couldn’t properly handle sunlight without ultimately washing out the colors in the process. In terms of battery life, our standard endurance test — looping a video with a series of notifications rolling in the background — went on for six hours and 45 minutes. 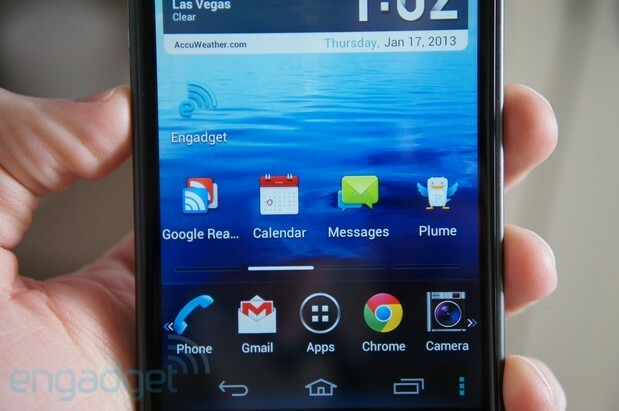 That’s hardly spectacular, but it’s still better than what we saw on the HTC One VX. What this means is that moderate users can make it through an entire day before having to charge up the phone, but anyone who uses the device extensively will get a solid nine or 10 hours out of it. However, unless you’re barely using it, you shouldn’t expect it to last overnight and into the next day. On AT&T’s LTE network in Salt Lake City, the Discover zoomed through speed tests at an average of 18 Mbps down and 12 Mbps up. Keep in mind that this number may vary depending on the strength of your local network. We had mixed results with the phone’s WiFi performance; on multiple occasions it randomly disconnected from our preferred network and would refuse to reconnect again (it often would get stuck in an endless loop, going back and forth between “connecting” and “saved”). Quickly shutting WiFi off and then turning it on again typically resolved the problem, but that’s of course an annoyance. When it came to actually making phone calls, our callers could hear us perfectly loud and clear. Noise cancelling was in full force, as callers had no idea that we were in a noisy room. On our end, other voices came through crystal clear, although the volume was a little softer than we would have preferred. So what about the dual 3D surround sound speakers on the Discover? In a couple words: not bad. Thing is, it’s louder than your typical budget phone, so in that sense you’re getting your money’s worth; however, we could barely tell any difference between it and the audio output on flagship phones like the iPhone 5 and Samsung Galaxy S III. In fact, when doing direct comparisons between the three devices, the Discover’s sound was on the tinny side and not as full or rich as the others. Again, it’s pretty good for its intended price range, but not the best out there. One other thing: while the surround sound concept works okay when the phone’s in portrait mode, it’s a completely different story when you’re watching movies in landscape, since both speakers are on the same side. It’s pretty difficult to mimic stereo sound very well with this kind of setup. Going by the spec sheet alone, the Pantech Discover blows away any other brand-new device in its price range — you may see some better-specced phones on sale around the $50 margin, but this surpasses any other budget or midrange phone that has begun at this particular cost. On AT&T’s network, the next in line would be the HTC One VX, a phone that for the same amount of money snags you a qHD display, 5MP rear camera, 8GB internal storage and a few other mid-range specs to go along with it. While we were fond of the VX, the Discover ultimately offers more bang for your buck. 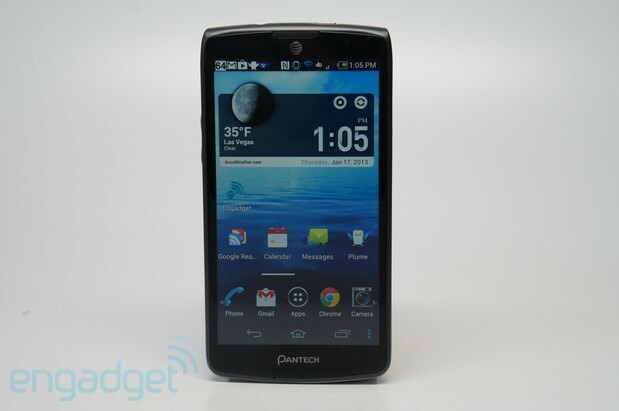 With each of its recent phones, Pantech has shown that it’s possible to make an inexpensive handset without sacrificing premium components. It specializes in the lower-end (in the US, at least), and it does its job very well. With a going price of $50 (after a two-year commitment), it’s sure to turn quite a few heads. It’s far from perfect, of course, but right now, at least, we have a hard time seeing how anyone could make a better budget device. 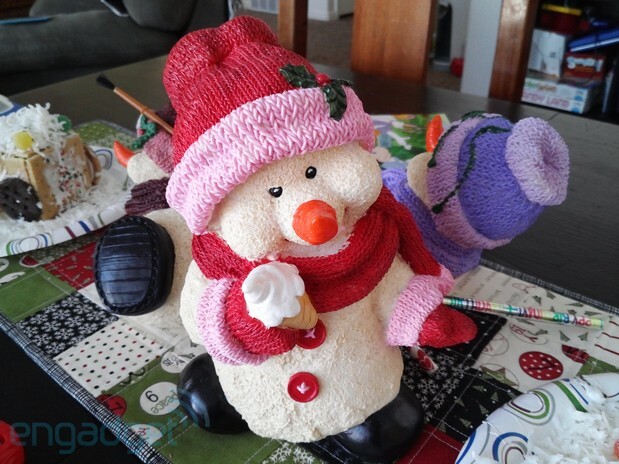 This entry was posted on January 19, 2013, 5:32 pm and is filed under Mobility. You can follow any responses to this entry through RSS 2.0. Both comments and pings are currently closed.